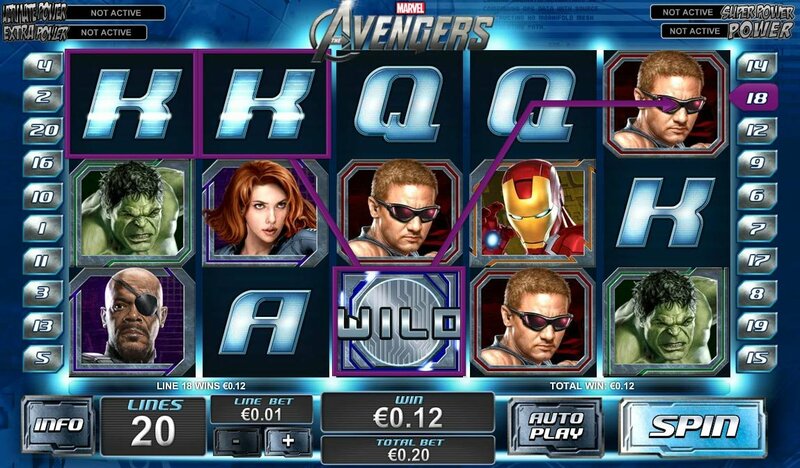 Play Avengers Slot Game Online - Spin to Avenge! The Avengers slot game presents a force to be reckoned with. If the opening intro doesn’t get you excited, then be sure to stay tuned because surely the superpower graphics, jackpots, and bonuses will do the trick. The Avengers slot game is based on the Marvel Comic series and 2012 superhero film starring Robert Downey Jr., Chris Evans, Chris Hemsworth, Scarlett Johansson, and Samuel L. Jackson about a team of super humans fighting to save the Earth from Loki and his army. Personally I’m not a huge fan of super hero comic books, but I can’t deny that this video slot had me entertained. The Playtech Avengers slot game includes 5-reels and 20 paylines along with wild symbols, scatters, and images of your favorite Marvel superheroes. With pristine graphics, crystal clear sound effects, and seamless software, the Avengers game offers an action-packed online gaming adventure. The Avengers slot machine graphics live up to the superhuman standards that one would expect from such a game. The graphic designers really perfected every detail of the game. During a winning combination, the Avenger Superheroes flaunt their super powers and electrify with radioactive kryptonite. The game also features crystal clear sound effects and music. If you hesitate to play the game, a man in a deep, mysterious voice says, “Spin to Avenge”. The Avengers slot machine really exemplifies high-quality standards making it difficult to find any flaws in the graphic design. The Avengers slot game includes 5-reels and 20 paylines along with wild symbols, scatters, and images of your favorite Marvel superheroes. With pristine graphics, crystal clear sound effects, and seamless software, the Avengers game offers an action-packed online gaming adventure. 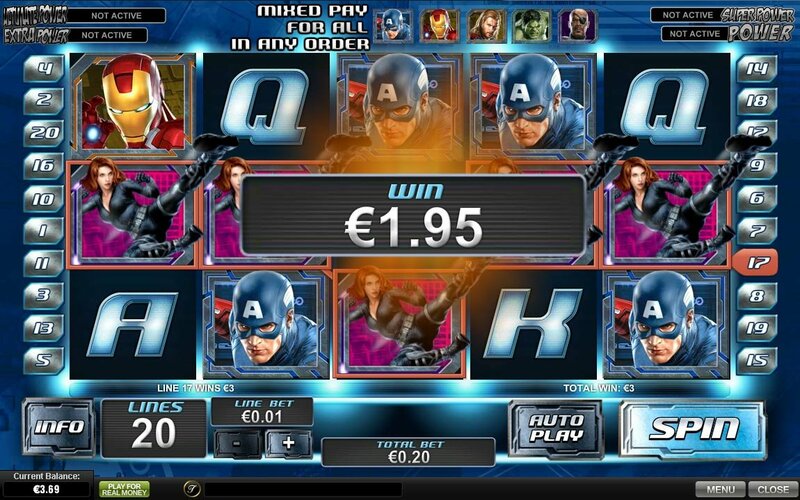 On top of the superior game design, the Avengers slot machine also offers a powerful number of online gaming features. “The Avengers Assemble on Reels Feature” awards 200X the line bet when all 5 Avengers characters appear consecutively in any order on an active payline. If 3 or more of The Avengers icons appears on the reels, the game will trigger the Wall of Heroes Bonus. During this bonus round, 20 platinum “A” symbols appear in rows and columns for a game that’s similar to Memory. You must choose icons to reveal an avenger. 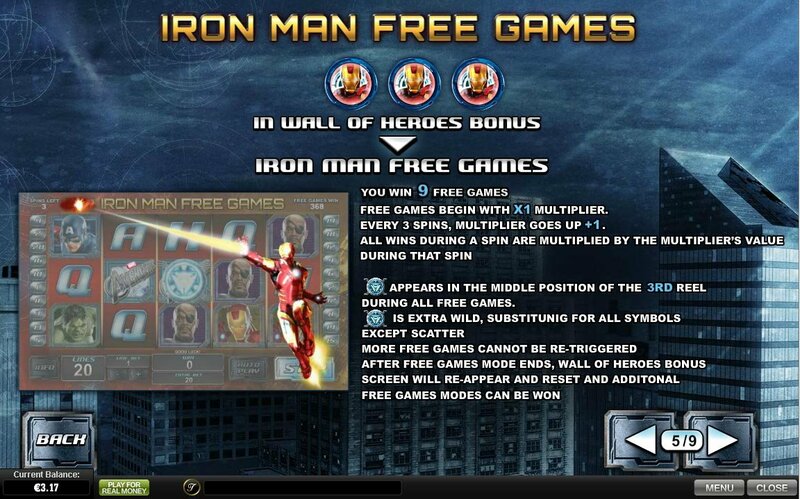 If you match 3 of the same Avenger superheroes, you receive free spins. Watch out! If you choose Loki, the Wall of Heroes bonus ends and the main game resumes. During the Wall of Heroes Bonus, lucky players receive special bonuses if they find 3 pictures of the Hulk, Iron Man, Thor, or Captain America. If you match three of these super hero icons, you win 9 free games. Each superhero then offers specific additional bonuses. For example, if you choose Thor, lightning shoots from his hammer, randomly distributing 0-5 extra wild symbols on the reels. Extra wild symbols will substitute for all except the Avengers wild symbols, raising the chances of winning. As is the case with all other Marvel slots, the Avengers slot links to four different progressive jackpots: Power, Extra Power, Super Power, and Ultimate Power. Any spin of any amount in the slot game will enter you into the jackpot, including spins with no game wins. However, the higher the bet, the better the chances of entering the jackpot game.